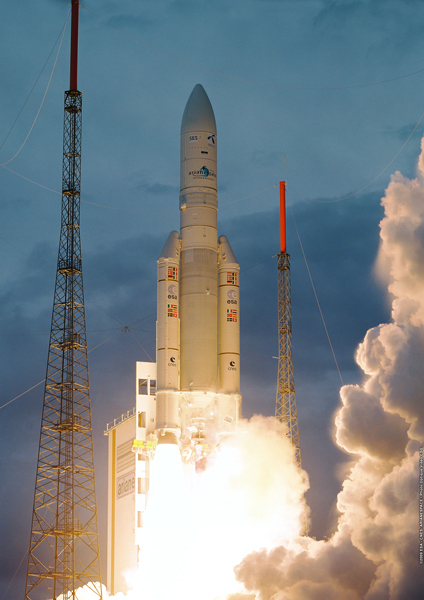 Ariane 5 is the most sophisticated European launch vehicle. It has delivered over a hundred satellites into their operating orbit. Airbus Defence and Space Netherlands is responsible for the design of the engine frames the Ariane 5 launcher. Airbus Defence and Space Netherlands current involvement in the development of future launchers such as Ariane 6, finds its origin in the company contributing to the earliest European launchers designed as off the mid-seventies. Since the start of the development of a European family of launch vehicles, then-named Dutch Space had turnkey responsibility for the design, analysis, development, qualification and manufacture of the third stage engine frame for Ariane 1 through 4. In 1985, ESA decided on the development of a next generation space carrier vehicle. The development led to the current Ariane 5. The first Ariane 5 was launched in 1996. The rocket is 52m2 tall, which is equal to a 15-storey building. When it lifts off the launch pad, it weighs over 760 tons, which is equal to around 500 cars. Airbus Defence and Space Netherlands has been designing and developing the complex and lightweight structures of the engine frame for the first and second stage of the launcher together with Fokker Aerostructures since 1991. The engine frame, built in the Netherlands, has a mass of 2,000 kg, which is equivalent to an SUV, yet the force that the motor frame exerts is 100 times greater than its own weight. In only 9 minutes after lift-off, the engine reaches its maximum velocity of 25000 km/h at an altitude of about 200 km. At this speed you could travel from Amsterdam to Paris in 100 seconds. Since the first launch, over 75 Ariane 5 space launchers have delivered well over a hundred satellites into their operating orbit. Ariane 5 is also the vehicle that launched the ATV series, which provided astronauts in the ISS with food, water, atmospheric gases and research equipment.